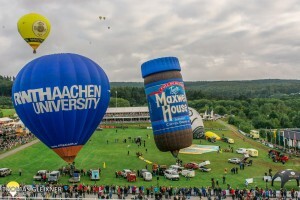 Remembering free beer and fine flying Neil Iveson arranged to take the BBM&L’s Maxwell House to the famous Warstein Balloon Meet in Germany. Despite a slow beery start he and his Team had a very fine time and recommend this meet to anyone. Here’s his report. 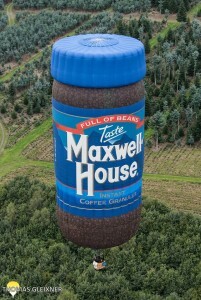 After the enjoyment of the Joure balloon festival in July a plan was hatched to take the BBM&L’s Maxwell House balloon to Warstein. Having gone through the effort of having it inspected it seemed a good idea to make a bit more use of it. For this trip team BBM&L consisted of myself, Neil Iveson, Andy and Jane Austin along with Gareth Bufton. Warstein runs for a week In September with flying days being Saturday to Saturday, with both morning and evening flights. Although the event had started on the Saturday, we planned to arrive on the Monday due to Chatsworth House dates clashing on the first weekend. We arrived on the Monday to find out from Andy Kaye’s Team Khaos that up to that point there had been no flying due to rain and it looked to be the same for at least another day. Monday evening briefing confirmed this with the Monday evening and Tuesday am’s flights being cancelled. As is often the way when there is no flying they announced free beer for an hour. For a brewery this was probably not even noticeable to their profits but it certainly seemed to perk up a few balloonists. Tuesday evening provided the first flying slot with a nice light wind to the south and the valley of Meschede. Most of the flight was over forest with steam rising creating some great images of balloons with broken cloud. 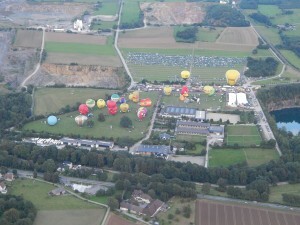 Meschede is in a reasonably deep valley so the majority of balloons landed here. As the wind was only about 1 knot most landed on a deserted road side half way up the valleyside. Traditionally the Wednesday morning flight takes place from Padderborne Airport. Sadly the weather wasn’t good for the slot so the airport launch was postponed until Thursday. The evening slot provided a different direction over the neighbouring forest. The forest off to the west is 23km in length and deserves a good look at the map, but at 15+ knots forecasted it sounded ok. After take off we only found 8kt. A few quick fuel calculations later we decided to land in the first valley after Warstein. Dropping down into the valley we were presented with 2kt and lots of nice grass fields to choose from. The decision to stop early provided the good side effect of getting an early meal before the other teams returned and the towns restaurants got busy. Thursday am’s weather was perfect. After quick briefing and we all set off on the 20 minute drive to Padderborne airfield. The launch site at the airfield is the grass strip between the taxi ways and the runway. The airfield does have international flights with 737’s and other large private biz jets so it is amazing that they are so accommodating to allow this. Try to imagine this happening in the UK! 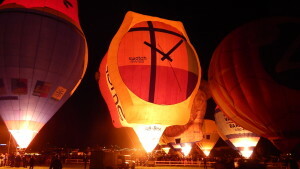 About 80 balloons launched form the airfield with a classic 15kt at 1500ft followed by a 1.5kt stand up landing. The only issue in the distance down wind was Dortmund airport and we could not enter their airspace. Still, all balloons managed a wonderful one hour flight followed by a rather welcome breakfast at a trucker’s café just before getting back to Warstein. Not far from Warstein is the Mohnesee Reservoir with the the Mohne dam which was attacked by the famous Dambusters raid in WWII. 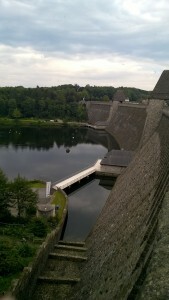 During some down time we took the opportunity to visit the Mohne Dam and take in the sense of what happened there. Walking across the dam it was quite easy to see what was original and which bit had been rebuilt. 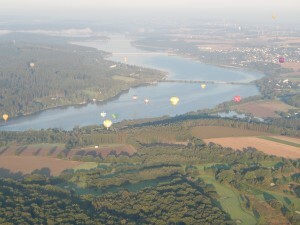 Ironically Friday morning’s flight took the balloons to the Mohnesee Reservoir with some managing to flight right over the dam. Apparently you are not allowed to splash and dash in the reservoir due to it being a drinking water and something about contamination fears. This seems odd when you see the large number of pleasure cruisers constantly sailing around the reservoir leaking diesel. Saturday morning provided the opportunity for another interesting flight. There was very little wind on the ground and 20kt at 1500-2000 ft. We flew north and over the windmills. Once clear we descended and almost instantly went from 20kts to 8kts in an instant. That was rather interesting in the special shape, but thankfully Maxwell House is a stable shape and it was probably no different to the experience in a normal balloon. Back down to 3kt at ground level it led to yet another uneventful landing next to a road. Although Saturday evening was looking flyable, we were leaving early Sunday morning and not wanting to have to offload too much gas we decided not refuel after the Saturday morning flight. To make up for this for Sunday night we decided to do a short stand-up for the crowd. The evening didn’t seem to be that breezy, but once Maxwell House was stood up is soon seemed breezier than expected and it never really stabilised. After five minutes of rocking from side to side we decided enough was enough and took the balloon down before we risked any damage to balloon and more importantly our trusty crew. 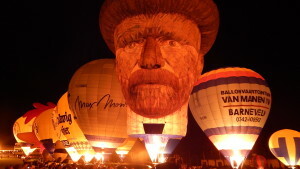 The Van Gough team had planned to do an inflation but rapidly reversed their decision after seeing Maxwell House swaying around! Having managed seven flights and one stand-up inflation we went home happy that we had been blessed with some amazing & memorable flights. It had been many years since I went to Warstein and was pleasantly surprised by how hilly the area was providing some great valley areas to duck into for a nice stand up landings. LRO wise, the majority of fields are open to the road meaning in the light winds we had the retrieves were very easy. The farmers we met were all very friendly and helpful. It has certainly left us with good memories and a the thought to return next year.